The lungs are a pair of elastic, spongy organs used in breathing. 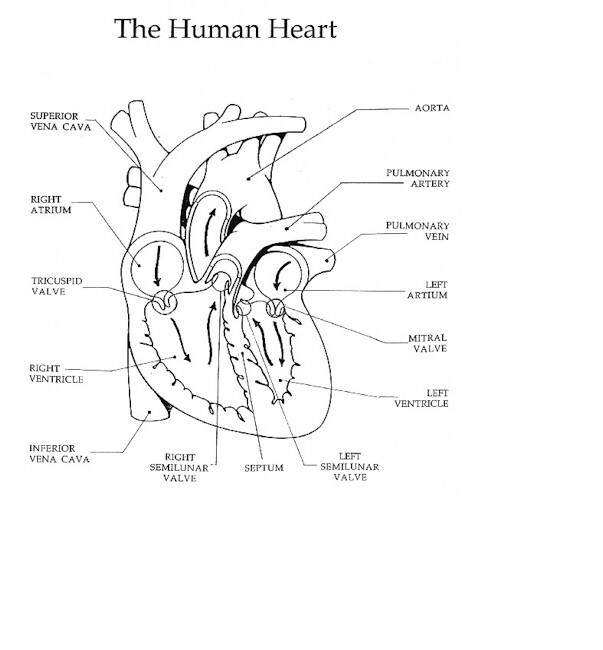 In humans the lungs take up a lot of the chest cavity. They are located just behind, and to either side of, the heart. They extend down from the collarbone to the diaphragm (the muscular wall between the chest cavity and the abdominal cavity). In adult humans each lung is 25 to 30 cm. long (10 to 12 in.) and roughly cone shaped. The right lung is somewhat larger than the left lung because it has three lobes, or sections, whereas the left lung has only two. When we breathe, the air travels to the lungs through a series of tubes and passages. The air enters the body through the nostrils or the mouth. It travels down the throat to the windpipe. Inside the chest cavity the windpipe divides into two branches, called the right and left bronchial tubes that enter the lungs. The large bronchial tubes branch into ever smaller tubes, called bronchioles. These in turn divide into even narrower tubes. Each small tube ends in clusters of thin-walled air sacs, called alveoli. It is the alveoli that receive the oxygen and pass it on to the blood. The alveoli are surrounded by tiny blood vessels, called capillaries. The alveoli and capillaries both have very thin walls, which allow the oxygen to pass from the alveoli to the blood. The capillaries then connect to larger blood vessels, called veins, which bring the oxygenated blood from the lungs to the heart. The largest veins that do this work are called the pulmonary veins, and they connect directly to the heart. Sometimes we use the terms breathing and respiration to mean the same thing, but they actually are distinct processes. Breathing is the process of moving oxygen-rich air into and out of the lungs. Respiration refers to how the cells of the body use oxygen to create energy and how they exhale carbon dioxide that is a waste product of this process. The lungs have to work continuously because the body cells are constantly using up oxygen and producing carbon dioxide. Unlike the heart, the lungs have no muscle tissue. Instead, muscles in the rib cage and the diaphragm do all the work of lifting the ribs upward and outward to let the air in, and then relaxing to force the air out. Why are oxygen and carbon dioxide such important gasses? All cells of the body need energy to do their work. They get energy by combining sugars or other food materials with oxygen. This chemical reaction is something like burning. Inside the body cells the chemical reaction gives off heat and other forms of energy. This energy provides the power we need to talk and move and think. When a fire burns, carbon dioxide is formed. When a body cell combines sugar with oxygen to get energy, carbon dioxide is formed there, too. But too much carbon dioxide could poison a cell. They need some way to get rid of carbon dioxide. 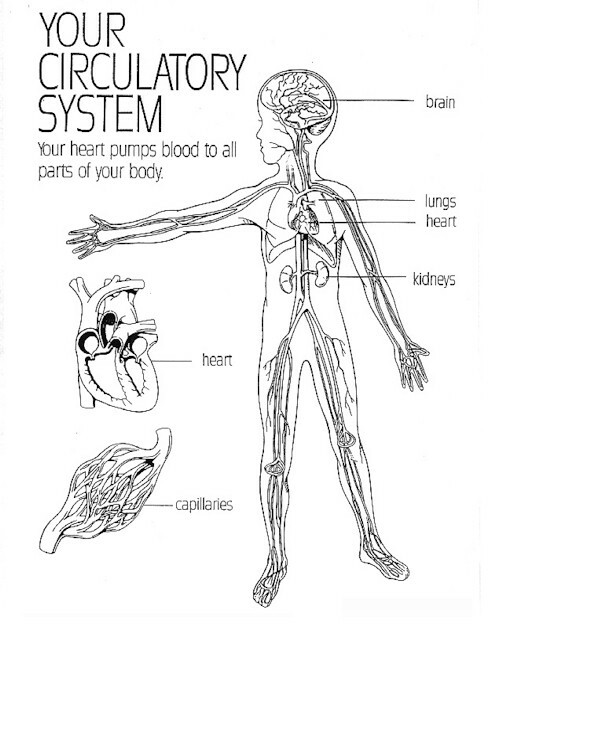 The blood brings oxygen to the body cells and takes away their carbon dioxide. The blood that travels back to the heart and lungs is dark red. It has picked up carbon dioxide from the body cells, and it has left most of its oxygen with the cells. We can think of the dark colored, carbon dioxide-rich blood as "used blood. This is the blood that the heart pumps into the lungs. The carbon dioxide in the blood is exchanged for oxygen in the alveoli. These tiny air sacs in the lungs are only one cell thick and they are surrounded by capillaries that are also only one cell thick. Blood from the heart flows through these capillaries and collects oxygen from the alveoli. At the same time, carbon dioxide passes out of the capillaries and into the alveoli. When you breathe out, you get rid of this carbon dioxide. The bright red, oxygen-rich blood is returned to the heart and pumped out to the body. We can think of it as "fresh blood -- it is as good as new!